Gout is a kind of arthritis. Gout or Joint Pain is a very common problem among all age groups. Gout is a painful condition that occurs when the bodily waste product uric acid is deposited as needle-like crystals in the joints. The main reason behind this disease is due to the raised level of uric acid in your body. Your chances of getting gout are higher if you are overweight, drink too much alcohol, or eat too much meat and fish that are high in chemicals called purines. Today I am sharing some facts about gout. 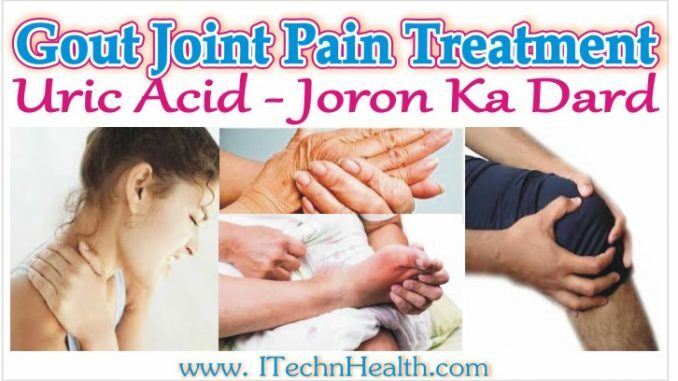 Reading this article at the end you will get Information On Gout, Reason behind Gout Joint Pain, Treatment of gout, Uric Acid- Joron ka Dard, what can i take for gout, gout symptoms and treatment, how do you treat gout and amazing juice for Uric acid and joint pain relief. Gout is a painful disease which makes the joints (places where two bones are connected), especially the feet, knees and hands, swell. Gout disease can cause abnormalities in multiple joints, especially the joints of the lower leg. It usually occurs in the joint area of the foot. But it continues to attack other areas, such as knees, elbows, ankles, wrists. The main reason of this disease is Uric Acid. Let us discuss abut what is Uric Acid and What is Normal Range of Uric Acid in human body. Uric Acid can lead to joint pain. Uric acid is a chemical created when the body breaks down substances, most uric acid dissolves in blood and travels to the kidneys. High levels of uric acid in the blood, also called hypoglycemia (a medical condition resulting from dangerously low levels of sugar in the blood) can result from either increased production of uric acid in the body or decreased excretion of it through the kidneys. In general, every person has the uric acid levels, because the third intake of foods containing purines. A normal part of all human tissue, purines are found in many foods such as anchovies, asparagus, beef kidneys, brains, dried beans and peas, game meats, gravy, herring, liver, mackerel, mushrooms, sardines, scallops, sweetbreads you should avoid to these as you can if it necessary to eat then take a very little amount from this list. Normally, uric acid is dissolved in the blood and passed through the kidneys into the urine, where it is eliminated. The raised level of uric acid in human body can be cause of pain in arthritis, kidney stones and kidney failure. Below is the range of uric levels for men and women. Study says that Gout is mostly common in men than Women. Gout is not a very dangerous disease, but this disease is very disturbing your activities. The main symptoms o this disease is remarkable changes in skin, skin becomes red, swelling, and ultimately the patient is not able to run perfectly. When uric acid levels in your blood are too high, the uric acid may form hard crystals in your joints. More than the normal amount of uric acid, causing other health problems also such as hypertension, blood cancer and hyperlipidemia. Here are some main cause of Gout. Many people with gout have a family history of the disease. Gender and age.It is more common in men than in women and more common in old age than in early age. Alcohol consumption.Drinking too much alcohol can lead to hyperuricemia, because alcohol interferes with the removal of uric acid from the body. Eating too many foods that are rich in purines can cause gout. A number of medications may put people at risk for developing gout. They include Diuretics, Salicylate-containing drugs, aspirin, Niacin, Cyclosporine and Levodopa. To ease the pain during a gout attack, rest the joint that hurts. Taking ibuprofen or another anti-inflammatory medicine can also help you feel better. But don’t take aspirin. It can make gout worse by raising the uric acid level in the blood. To stop a gout attack, your doctor can give you a shot of contortionists or prescribe a large daily dose of one or more medicines. The doses will get smaller as your symptoms go away. Relief from a gout attack often begins within 24 hours if you start treatment right away. Chronic gout is often referred to as “Arthritis Gout” is a disease that attacks the joints to cause inflammation. The main reason of this disease is due to disturbance of uric acid that is not treated immediately. You can read my post linked below to know all about Arthritis Gout and effective home remedies for this disease. 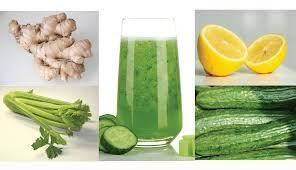 You can make this juice yourself at home, just try to this drink and see the miracle. It is very effective and good juice to treat uric acid levels because all its ingredients like Cucumber, Ginger, Pineapple and Grapefruit are very helping for maintain uric acid level in body. When there is swelling, you should rest. Went to the doctor to get medicine. Controlling the levels of uric acid with a low purine diet not eating foods that may exacerbate the amount of uric acid such as Beef, shellfish, dried beans, cauliflower, spinach, asparagus, green beans, mushrooms, cassava leaves and papaya leaves.